Fig. 1 Centripetal force induced in the swirl flow. Fig. 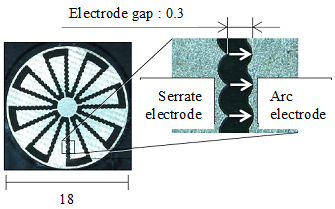 2 Configuration of electrode substrate. Fig. 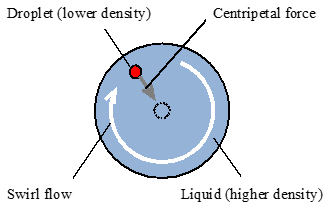 3 Actual view of the mixing experiment: A red droplet moves spirally to the center and becomes in contact with a blue droplet at t = 2.60 s. Afterwards, two droplets keep rolling together and mix at t = 3.96 s. Droplets stay at the center of the chamber until applied voltage is off. Fig. 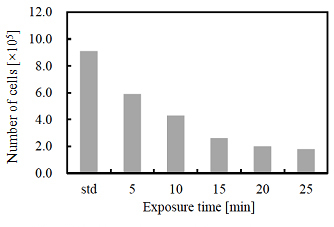 4 Number of cells remained on the culture substrate after the ECF exposure. (1) Yokota, S., Kawamura, K., Takemura, K., Edamura, K., “High-integration Micromotor using Electro-conjugate Fluid (ECF)”, Journal of Robotics and Mechatronics, Vol. 17, No. 2 (2005), pp. 142-148. (2) Yamaguchi, A., Takemura, K., Yokota, S., Edamura, K., “A robot hand using electro-conjugate fluid: Grasping experiment with balloon actuators inducing a palm motion of robot hand”, Sensors and Actuators A: Physical, Vol. 174 (2012), pp. 181-188. (3) Takemura, K., Yokota, S., Imamura, T., Edamura, K., Kumagai, H., “Practical design of a liquid rate gyroscope using an electro-conjugate fluid”, Proceedings of the Institution of Mechanical Engineers, Part I: Journal of Systems and Control Engineering, Vol. 223, No. 6 (2009), pp. 727-736. (4) 小林紀穂，倉科佑太，竹村研治郎，横田眞一，枝村一弥，“電界共役流体を用いたDroplet μTASのための液滴混合デバイスの開発”，日本機械学会論文集，Vol. 80, No. 819 (2014), No. 14-00288.